“Dr. Gallo has been a mother to all of Central Falls' children. She changed the course of so many lives in our City. She is a passionate, committed and selfless visionary who gave her life to social justice and student empowerment. I will have much more to say in the coming days, but her leadership inspired me beyond words and she will be missed dearly." In an effort to assist city residents braving the bitter cold, the Providence Journal reports that the City of Central Falls has opened a warming center from Wednesday through Saturday at the Forand Manor (30 Washington St). CENTRAL FALLS, R.I.—On Wednesday, December 17, The Central Falls Fire Department received a fire prevention grant from FM Global, one of the world’s largest commercial property insurers. CENTRAL FALLS, R.I.—On Thursday, December 18 from 5:30-7:30pm, Mayor Diossa in partnership with VPI Distribution and Warehousing, will host a job fair for Central Falls residents. VPI will be accepting applications for employment for various job positions, including assembler, packagers, team leader, loader, and more. Festival and fireworks set for Saturday in C.F. CENTRAL FALLS – The third annual Bright Future Festival will kick off Saturday afternoon, with a diverse celebration of the city's culture, including dance and musical performances, and concluding with a firework display. New York, June 23, 2014 -- Moody's Investors Service has upgraded the City of Central Falls' (RI) general obligation rating to Ba3 from B1, affecting $8.7 million in outstanding general obligation bonds; the outlook has changed to stable from positive. Moody's has also affirmed the Ba1 underlying rating with a stable outlook on the Rhode Island Health and Educational Building Corporation's (RIHEBC) Series 2007B bonds, affecting $4.9 million in rated RIHEBC pooled debt. CENTRAL FALLS — The City Council Monday approved Mayor James A. Diossa’s $17.2 million budget for the new fiscal year that begins July 1. The city budget is composed of five separate city ordinances. The city ordinances that set the tax rate and levy, the classified employees wage schedule and the capital program and budget were passed unanimously by the six-member council. 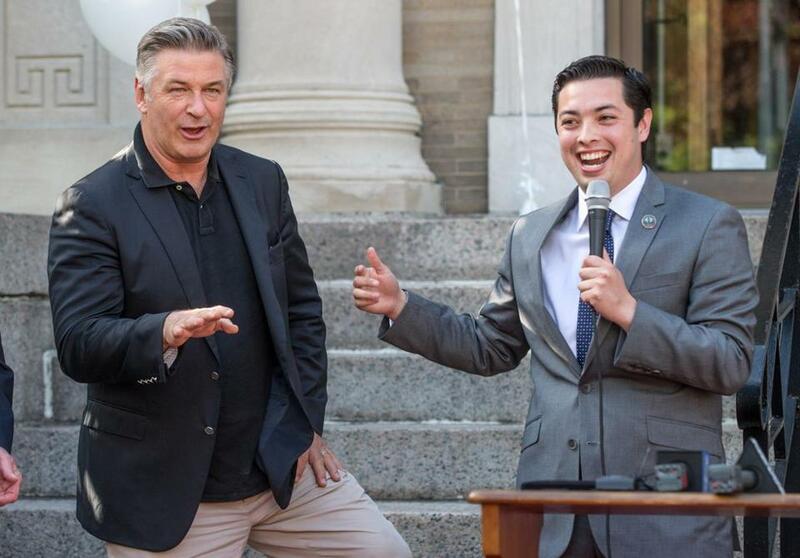 Alec Baldwin (left) was presented with a key to the R.I. city by Mayor James Diossa. CENTRAL FALLS, R.I. — They would seem, at first glance, to have nothing in common: the small, struggling Rhode Island city of Central Falls and A-list Hollywood actor Alec Baldwin.